Long ago I discovered that everywhere I look I find a teacher. Today it was Milly, my cat. I wasn’t expecting a moral lesson. I was busy shoveling a second trailer load of mulch into my flower garden. The dormant season is a great time to spread this rich black compost which I am able to acquire from the nearby town of Crockett. I go there to the local waste and recycling plant, park my utility trailer next to a row of tall, inverted-cone shaped mounds of ground-up leaves and branches that have been collected and piled up long enough to become perfect mulch. A nice man brings his earth-moving machine to scoop three big scoops of mulch onto my trailer. He would put more, but the trailer’s tires begin to go flat from the heavy load, so I wave him away and take my treasure home. Then the hard work begins–shoveling and bucketing the stuff out of the trailer, putting it carefully around my plants, spreading it three inches thick everywhere. By so doing, I may avoid having later in the heat of summer to weed the garden. I am also enriching the soil, returning the gifts of earth back to earth. I always feel good about this job, although I have to be careful of my back. While I work, I talk admiringly and encouragingly to the plants, take great pleasure in the crisp winter air, feel useful and productive. It’s odd. 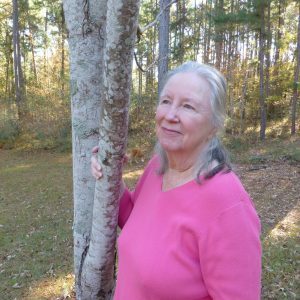 Winter in the north is a time to stay indoors out of the bitter cold, to do indoor types of things, but the seasons are reversed here in East Texas: it’s summer’s heat and humidity that drives us inside, into the air conditioning. Here, winter delights. The winter weather is never cold or miserable for more than a few days at a time, and usually it’s absolutely perfect. Therefore, in January, I devote myself to the outside world, cutting trails in the tangled thickets, gathering firewood, and especially working in my garden. So now you may picture me there, shoveling mulch, on a cold but sunny day. Picture also the black lab, lying to one side, head on his fore paws, watching me lazily. There’s also the other cat, Tux (so named because his coat reminds me of a tuxedo), who stays, uncharacteristically, well out of the way of my swinging shovel. Milly, on the other hand, is everywhere at once. I can’t help noticing her. 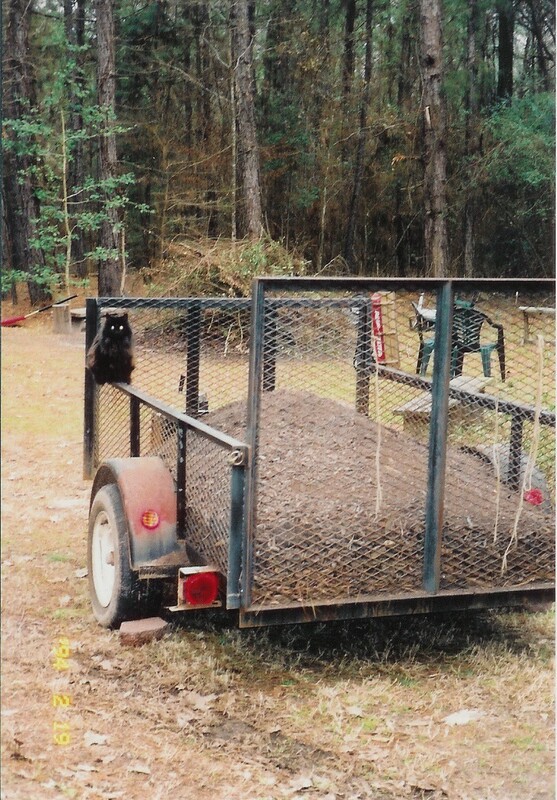 She perches delicately on the narrow iron sides of the trailer. She rubs against my legs. She sits on my bucket when it is at rest. She walks in front of me, around me, behind me, all the time mewing and purring and carrying on. I am struck by how she’s behaving. Oh, always she’s sweet, and anytime she loves it when I’m outside with her. But this behavior today is over the top! She doesn’t stop her various expressions of delight, but goes on and on with it, prancing around, having a great time. I am puzzled by her, until I notice her pawing around in the mulch, again and again, still meowing at me in a sort of happy sing-song statement that, at last, I begin to understand. She thinks I have hauled these trailer loads of wonderful mulch in here and spread it around so thick everywhere just to create for her the world’s best outdoor kitty litter box!! She thinks I’ve done all this just for her!! I laugh out loud with delight. Why not? If I’ll do it for flowers, why not for Milly? But then, as I go back to work, my mind does it’s usual diffuse, willy-nilly, wandering path-taking, metaphor-making sort of thing, leading me eventually to the thought that Milly, in her self-directed perception of the meaning of this thing, is no different from humans when they assume that God has prepared this world for the benefit of the human species alone, or that any of us are, so to say, God’s chosen people. Surely, I think, God (whatever you mean by that word) has a bigger picture than we humans have of whatever is going on here, and probably, I imagine, a broader spectrum of reasons for arranging things than just for our human convenience. The human-centered consciousness that historically we in the western world have carried has always puzzled me. Why, I wonder, would whatever blessed power and wisdom that arranges things in the universe choose to favor us? I can’t see any reason we are more special than anything else. In fact, I can see just the opposite! Few if any other species seem so violent, so eco-destructive or self-destructive. Few other species soil their own nests as we do our environment, our air, our water. Few other species seem so self-absorbed or ungrateful. Oh, I know the argument. We are aware. We can think, reason, plan. We humans have a special consciousness. And other things don’t? Anyone who thinks that should hang out at Earthsprings for awhile! Or they could watch the movie Winged Migration, which so beautifully shows those many varieties of birds that know how to fly from one end of the world to the other, season after season, finding their way exactly and purposefully. Those birds have an exquisitely perfected, innate consciousness that we humans don’t have; I couldn’t do that migration thing the way they can. Nor do I have a built-in capacity for sonar as do the whales and bats, or the given engineering skill of beavers. I find wisdom, intelligence, mindfulness enough in any part of nature to shame me whenever I assume such homocentric reasoning. How sad that I, like most other people, can ever forget and act as though I’m the center and reason for whatever is happening! How foolish and narrow our view if we think the world is our oyster and put here only for our dominance and pleasure, without regard to other living things! Why can’t we humans get a bigger perspective, one that might help to heal the planet and stop our self-serving wars? “When will mankind realize it is one? Will it ever bridge the gulfs that divide it? Another thinks he’s best because he came from Brahma’s mouth. When shall we give up rotting in fancied poses by the grace of the Lord? How true. And how I long for it to be otherwise. I ponder all this as Milly continues to mew and purr and thank me for the mulch. I am moved by her gratitude and delight, even if I didn’t do it just for her. So too, I think to myself, must the Greater Good that we call God be moved by our gratitude and pleasure, when we are mindful enough to offer it, even if things were not all designed just for our special benefit. Milly is a good teacher. I come away enriched myself, along with the soil in my flower garden, and obviously along with Milly. I am humbled by this simple interchange with Milly, the earth, and the thoughts that carry me in all directions. Always my thoughts carry me eventually to that inter-connectedness that is Home to me. My true religion, if I can be said to have one, requires that Spirit is present in all and any thing, seen and unseen, known and unknown, all mysterious but worthy to be honored, worthy of gratitude for the way it is and especially for the way it all fits together. I have my place in this over-all tapestry of life. I receive from the Universe, and I give back as I am able. Part of what I give back is my song of praise, my prayer of gratitude. Just like Milly, I delight in the abundance of what is spread before me. You are a part of all that, and so I send you these few words, connecting us again. May your winter be full of wonder. May you be aware of how much you matter, how everything you do can be a blessing to those around you–cats, people, nations, the world. My love goes with you.